No, this is not a vintage pu erh. This is a 2007 Kunming tea factory ripe pu erh cake. I had purchased this cake in Hong Kong in 2008 at Sin Fook Tea house. The proprietor had told me that this was a new cake. As there was no manufacturing date on the wrapper, my guess would be this pu erh was most probably a 2007 or 2008. I could break up the cake by hand. It just took me less than 5 minutes to break them up to small pieces and had the tea stored in my tea caddy. After making a few brews of this tea, I recommend that more tea leaves be used when you brew this tea. This will increase the aroma factor to a more herbal like scent. What I like about this tea is that it has a calming effect after I had consumed 3-4 infusions of the tea. No, I did not felt like some tranquilized animal but it seemed the tea had given me a couple of seconds of bliss. Nice. I know this sounds weird or crazy, but to me, this is what drinking chinese tea is all about - it makes me happy......going through the whole tea making sequence and drinking the brew......even its just for a few minutes. 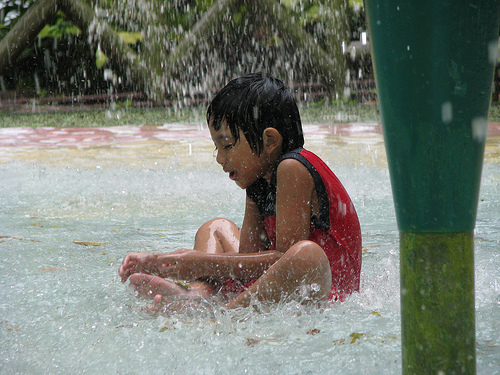 Just like the little boy in the last pix. Time to brew a a pot of tea. 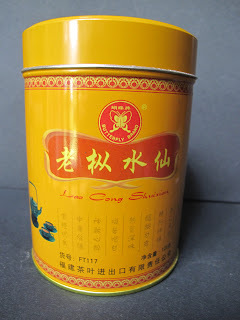 My blog entry on 16 Oct 2010 was on one of the most popular tinned 'Sea Dyke'' brand of Lao Chong Shui Xian. At that point of writing that blog, that particular tin of shui xian was going for $11. Today, buying another tin would set you back $16-18. This is a significant price increase. This price hike had hurt the pockets of a few local tea drinkers especially the retirees, who had been loyal tea drinkers of this tea for many years. I know a group of these retirees and a couple of these tea drinkers had started looking for cheaper alternatives. 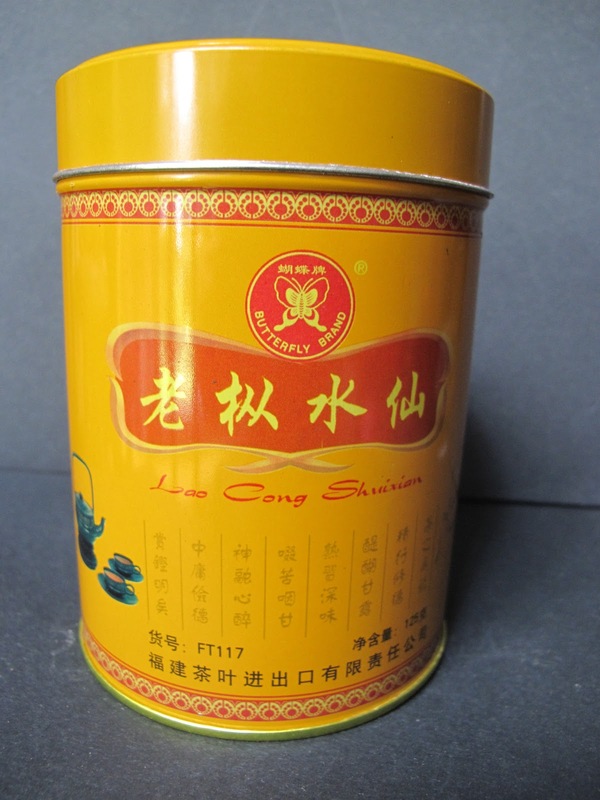 The pictures above is the 'Butterfly' brand of lao chong shui xian (notice the different spelling on the tin). This 125g tea is also packed in a nifty tea tin. Aroma of the tea is robust and fragrant. Taste is strong and enjoyable. Price - about $11-12 a tin. I was in Kuala Lumpur, Malaysia last December. I had the privilege that Auhckw, the famous tea forum contributor, brought me to visit a couple of teashops , sampling the teas and meeting his tea pals as well. He also gave me this 12 year old tuo (thank you). This 2000 Yin Hao tuo is described by Auhckw as "We have tasted this many times and we find that this is a good tea. Taste has gotten smooth and has Camphor (Zhang Xiang) taste. Price is not very cheap but still affordable. I bought some to test @ home. If its good, will topup more. Save me 10 years of waiting for my other new tea to age." This tea has many qualities of a nice raw tea. It has a nice aromatic light floral citrus-like scent together with a pleasant hint of smokiness. Sipping the tea is also enhanced by a light camphor aroma. There is a nice mildly bitter-sweet taste in this tea but drinking it resulted in a nice pleasant sweet finish. I could detect traces of astringency in the tea but with a couple more years of storage, I am sure that this tuo would be better if not more expensive. This 12 year old tuo now retails close to 50rm (about US$15). A brew of this tea yielded me about 8 good drinking infusions. Yes, the compression of this tuo is high and you would need your tea tools to break up the tuo. "Chinese entrepreneur An Yanshi is convinced he has found the key ingredient to produce the world's most expensive tea – panda dung. The former calligraphy teacher has purchased 11 tonnes of faeces from a panda breeding centre to fertilise a tea crop in the mountains of Sichuan province in southwestern China, home to the black and white bears. An says he will harvest the first batch of tea leaves this spring and it will be the "world's most expensive tea" at almost 220,000 yuan ($35,000) for 500 grams (18 ounces). Chinese tea drinkers regard the first batch of tea to be harvested in the early spring as the best and successive batches, regarded as inferior, will sell for around 20,000 yuan. The 41 year-old, who is so passionate about his new project he dressed in a panda suit for his interview with AFP, has been ridiculed by some in China for his extravagant claims of the potential health benefits of the tea. But he insists he is deadly serious, saying he quit his job at Sichuan University to throw himself "heart and soul" into his company, Panda Tea, whose logo features a smiling panda wearing a bow tie and holding a steaming glass of green tea. While An hopes to make money from the tea, which he has planted on just over a hectare (2.5 acres) of land, his main mission is to convince the world to protect the environment and replace chemical fertilisers with animal faeces – before it is too late. "Panda dung is rich in nutrition ... and should be much better than chemical fertilisers," An said, as he sat at a traditional Chinese tea table drinking tea grown with cow manure. "People should make a harmonious relationship with heaven, earth and the environment," An said. "Everybody has an obligation to protect the environment," he added, as he showed AFP dozens of traditional Chinese scroll paintings that he has created of cheerful-looking pandas, bamboo and calligraphy. The tea aficionado got the idea to use panda faeces as fertiliser after attending a seminar last year where he discovered that the bears absorbed less than 30 per cent of the bamboo they consumed, excreting the remaining 70 per cent. An showed journalists a glass jar of fresh-looking panda faeces, which he uses to fertilise two tea plants in his office, noting the "quality" and "green" colour of the dung. He is so convinced that Panda Tea will be a hit that he has patented the idea to prevent a competitor stealing it – a common occurrence in a country where laws protecting intellectual property rights are often flouted. His claim that the green tea will help people lose weight and protect them from radiation has been ridiculed by some Chinese web users, who have expressed doubts about the purported health benefits of the tea and the high asking price for the first harvest. "If it is such a good fertiliser for tea plants, I want to ask this teacher: why don't you just eat panda dung? Then you can get the rest of the 70 per cent nutrition," a web user called Baihuashu said. Another web user called 24-0 said: "Over 200,000 yuan per jin (500 grams) for panda tea fertilised by panda droppings – is that for drinking tea or drinking pandas' blood?" Despite the online detractors of his yet-to-be-tested tea, An said he remained undeterred and was already thinking about expanding his business. "After the first batch is harvested, if the quality is really good, we will expand the economies of scale," said An, waving his panda paws for emphasis."